Ingredients: Water (Aqua), Helianthus Annuus (Sunflower) Seed Oil, Alcohol, Glycerin, Manihot Utilissima (Tapioca) Starch, Cocos Nucifera (Coconut) Oil, Glyceryl Stearate Citrate, Melissa Officinalis Flower/Leaf/Stem Extract, Arachis Hypogaea (Peanut) Oil, Simmondsia Chinensis (Jojoba) Seed Oil, Prunus Armeniaca (Apricot) Kernel Oil, Anthyllis Vulneraria Extract, Bellis Perennis (Daisy) Flower Extract, Tropaeolum Majus Flower/Leaf/Stem Extract, Hamamelis Virginiana (Witch Hazel) Bark/Leaf Extract, Cetearyl Alcohol, Triticum Vulgare (Wheat) Bran Extract, Daucus Carota Sativa (Carrot) Root Extract, Fragrance (Parfum)*, Citral*, Limonene*, Geraniol*, Citronellol*, Linalool*, Hectorite, Lysolecithin, Xanthan Gum, Coco-Glucoside, Zinc Oxide (CI 77947). Usage: Each morning after cleansing and toning, apply a small amount evenly to the face, neck and décolleté with your fingers. If breakouts and frequent blemishes are a problem, substitute Melissa Day Cream with a mixture of Revitalising Day Cream and 1-2 drops of Clarifying Day Oil. 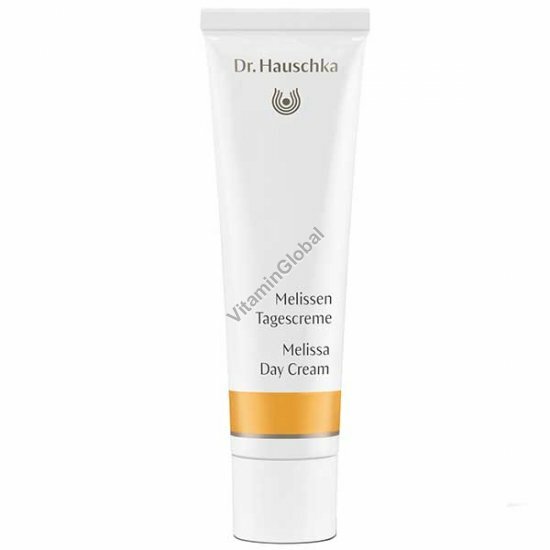 Melissa Day Cream is perfect as a primer before applying make-up. In the evening, we recommend using Night Serum or Sensitive Care Conditioner.